When Collingwood travelled to Adelaide at the end of the 1927 season to play a game against SANFL Premiers West Adelaide, the prime motivation was really to give the Magpie players a bit of thoroughly deserved rest and relaxation after a successful year. But the Pies received an unexpected – albeit short-lived – bonus from the trip when one of the West Adelaide crew “defected” to Victoria Park soon afterwards. Les ‘Eggie’ Thomas was on the bench that day for Westies, but he had played in the Premiership team a couple of weeks earlier. 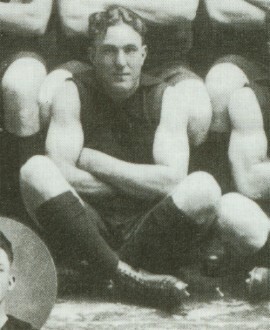 The Adelaide Register described him as being “in the first flight as a rover” and he’d managed 20 games and 20 goals in his first three SANFL seasons, forming part of the first ruck combination with SA footballing legend Bruce McGregor (father of tennis champion Ken), who became a lifelong friend. So it seemed like something of a coup when Thomas crossed to Collingwood for the 1928 season. Sadly, however, things didn’t work out as either side would have liked. The nuggety rover, who stood just 165cm tall, returned home after one season, having managed only two senior games. He remarked later how much stricter umpires were in Victoria and how the legitimate use of “weight” was very much a feature of the game over here. Although undoubtedly disappointed, Thomas went home knowing that life could throw much worse at you than simply missing out on some football games. The youngest of eight children, Leslie Frank Thomas and his siblings had been orphaned when ‘Eggie’ was just eight, and he was raised by his eldest sister, Carrie. He’d learned his footballing craft with the Coo-ee Juniors in the West Adelaide district. On leaving Collingwood he didn’t return to West Adelaide but headed instead to Sturt, where he played a further 18 games in two seasons, winning a trophy in 1929 for the most unselfish player. He played with a number of local clubs after leaving Sturt, finishing his playing days in Sydney in 1939 and 1940. Around this time he set up his own business as a plastering contractor, having been in the building trade since starting as an apprentice plasterer on leaving school. But he never lost his interest in football, coaching teams and also playing an active role in the South Australian Past Players and Officials Association. During his last 20 years, Les had to battle the crippling effects of old footy knee injuries and a bout of Golden Staph he contracted while in hospital. But footy had always been a big part of Les Thomas’s life, and even when he could no longer make it to matches he remained an avid follower on TV until his passing in 1997, at the grand old age of 91.